SSAKE is a de novo assembler for short DNA sequence reads. It is designed to help leverage the information from short sequences reads by assembling them into contigs and scaffolds that can be used to characterize novel sequencing targets. SSAKE is the first published algorithm for genome assembly with short DNA sequences. It assembles whole reads (not k-mers) and as such, is well-suited for structural variant assembly/detection. In 2016, SSAKE celebrates its 10th anniversary! Algorithms of SSAKE are the core of many genomics applications (eg. VCAKE, QSRA, SHARCGS, SSPACE, JR-Assembler) and their design continues to inspire new-generation assemblers (eg. JR-Assembler, PNAS 2013) (Figure 1). Applications of SSAKE extend beyond genome assembly and the technology was applied to profiling T-cell metagenomes, targeted de novo assembly, HLA typing and was key to the discovery of Fusobacterium in colon cancer. The US National Marrow Donor Program (NMDP)®/Be The Match® relies on SSAKE for HLA consensus assembly, which is cornerstone to their allele interpretation pipeline designed to match Donors and Recipients. The NMDP®/Be The Match® is a global leader in facilitating bone marrow and umbilical cord blood transplants to save the lives of patients with leukemia, lymphoma, genetic disorders, and other diseases. 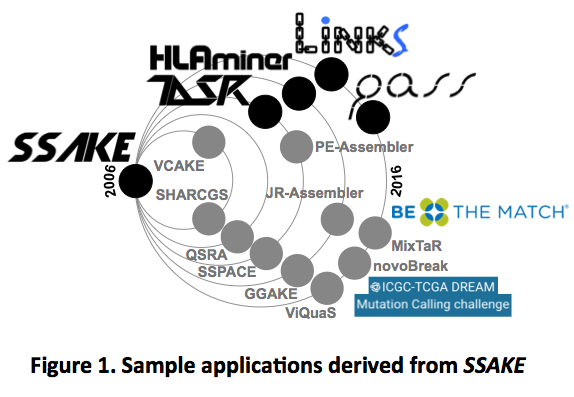 SSAKE is the assembly engine in the top-performing cancer genomic structural variant predictor pipeline software novoBreak in The ICGC-TCGA DREAM Genomic Mutation Calling Challenge. SSAKE is written in PERL and runs on Linux. SSAKE cycles through short sequence reads stored in a hash table and progressively searches through a prefix tree for extension candidates. The algorithm assembled 25 to 300 bp [genome, transcriptome, amplicon] reads from viral, bacterial and fungal genomes. SSAKE is lightweight, simple to setup & run and robust. We provide quality-trimmed HiSeq reads for a F. nucleatum CRC tumor isolate CC53. Copyright (c) 2006-2017 Canada's Michael Smith Genome Science Centre. All rights reserved.